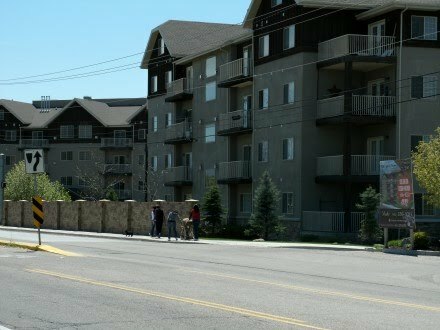 One of the big issues around last year's city council election in the city of Holladay focused on density. The existing council promoting density including Holladay Village and the rebuilding (if it happens...) of the former Cottonwood Mall sight. On the other side were the people running against the incumbents who fear density, thinks it will bring in "those kind of people" and basically want to stick their heads in the sand wishing there little enclave of acre lots will never change. This condo development located at the corner of Van Winkle and 1300 East is the perfect example of bad density. This complex does not in any way encourage the use of transit or walking. While people may walk out of the complex, the builders did not make it easy to do. In addition there is nothing within easy walking distance of this complex. If you need anything you either have a very substantial walk (which people are just not going to do) so they are going to drive. A complex like this does nothing but increase traffic congestion which and this is what comes to most peoples minds when it comes to density. Now take a look at this development in Pasadena, California. This place is near and dear to my heart. Not only did I grow up four blocks from these buildings, but this complex is situated around the former Santa Fe passenger station that I spent a lot of time at growing up. This is what is often referred to as Transit Oriented Development. 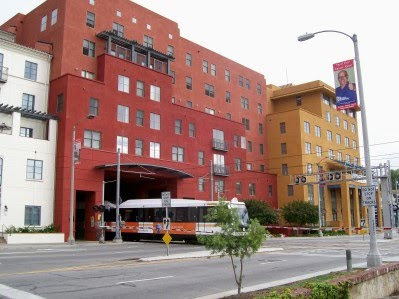 It focuses residential and commercial development at a transit station in this case the MTA's Del Mar Gold Line station. Now there is some good and bad associated with this complex. Residents have easy access to transit. All they have to do is walk a few feet out of their apartments and they can board a Gold Line train to Los Angeles. However that does not make good transit oriented development. What makes good transit oriented development is whether the complex reduces the number of short automobile trips. 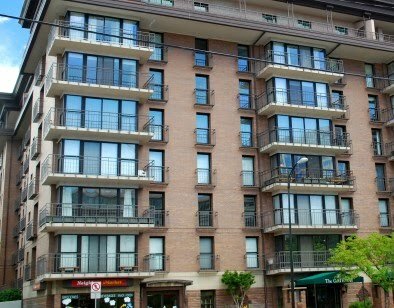 One of the benefits of this complex is that there is plenty of restaurants within walking distance. 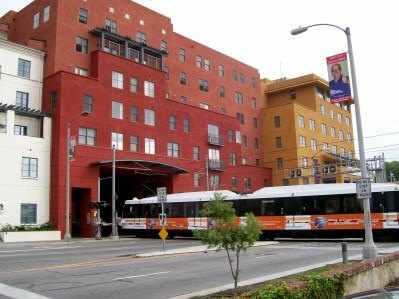 Even the former Santa Fe station has now been turned into a restaurant so residents do not have to jump in their car to get a bite to eat. On the other hand, the downside is that there is no grocery shopping in the immediate vicinity. While there is a Trader Joe's a few blocks away, if you need to grab an item or two the only solution is driving. There is a convenience store located across the street but it has a very limited selection even by convenience store standards. To make matters worse there is very little bus service in the area. Metro (MTA) has done a very poor job of coordinated bus service and rail service in the Pasadena area. The bus along Del Mar only runs hourly and you have to walk a couple of blocks to reach Colorado Blvd where most of the bus service exists. Another term that has recently come into use is TAD or transit adjacent development. While TOD encourages the use of transit or walking, TAD is located near transit but does not encourage the use of transit. Some extreme transit, pedestrian and bicycle advocates will paint anything that has parking as being TAD instead of TOD. However, the reality of today is that parking is still going to be needed and a complex will loose market share with out it. While it would be nice to be completely car free there is many people not willing to make that jump yet and 80 years of auto centric development has made it even more difficult. I applaud the people who have been able to become completely car free but right now they are a small minority. This is the Meadowbrook Station complex going in near, you guessed it, the Meadowbrook TRAX station. However, is this complex going to be TOD, or is it more TAD? At first glance things look positive. 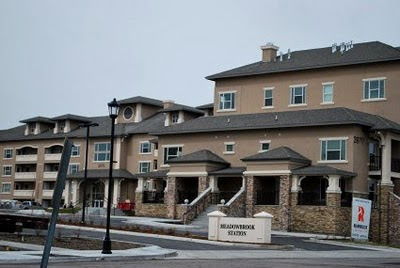 The complex is located within walking distance of the Meadowbrook TRAX station and is planning to have a retail element to it. However, then there is the current downsides. First of all, this complex is located in the middle of an industrial area. While the complex may eventually have retail and restaurants, at the present time there is nothing within walking distance of this complex. A person will have to use a car for most trips. In addition even bus service is hard to access because you have to walk to the far side of the TRAX station to even reach it. In addition the complex still has a big focus on parking. Like I said you do not want to eliminate parking altogether but this complex (along with the new apartment complex at Daybreak) still focus too much attention and the parking lot and not making access to transit easier. Hopefully, the area around the complex will eventually change and hopefully will create a transit oriented corridor all the way from the Meadowbrook Station down to the Murray North Station at Fireclay. Until that happens this complex will really have to be classified as TAD instead of true TOD. Notice at the bottom of the picture on the left the grocery store? That's right people in this complex and the surrounding area do not have to get in their cars in order to get a couple of items. They can just walk into this little store and get what they need. How many auto trips does this little grocery store eliminate by providing residents with an easy place to buy groceries? Now back to Holladay and the issue of Holladay Village. 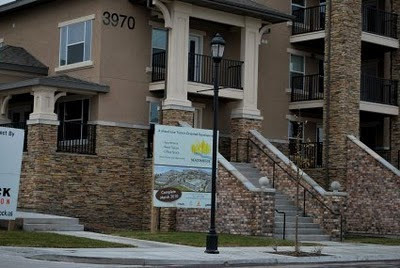 Will Holladay Village be good density or bad density? Well first of all it does have 3 bus lines servicing it from good bus service (45) , to barely adequate bus service (228), to useless bus service (223). Second there will be shops available for residents to shop in and restaurants nearby so the complex could eliminate some automobile trips. Finally there is a grocery store located across the street so residents do not have to drive to the market. In fact by the time they go through the parking lot to their car they would be halfway to the Village area so why bother driving? ( I know many still would..). So Holladay Village would not be a bad development. It could actually eliminate more auto trips that the new Meadowbrook Station complex. Density, TOD, and TAD are complex emotional issues that you need to look beyond the surface and truly see how the development will function and be part of the community.